Oman is a country of varied landscapes, from its beautiful coastline, sandy deserts to the rocky Western Al Hajar Mountains which dominate the landscape of Muscat. 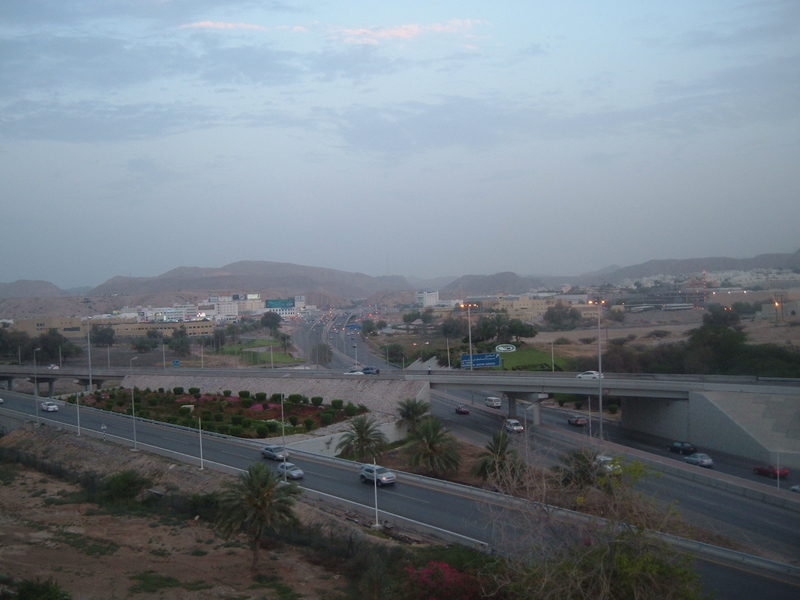 Views of the city’s landscape seen from different locations will typically consist of low lying white buildings nestled amongst the rocky Hajar mountains. Since the ascension of Qaboos bin Said as Sultan of Oman in 1970, Muscat has experienced rapid infrastructural development which has resulted in a modern clean city with well laid out roads. Navigating through the city is pretty easy, it’s one main arterial road that takes you from the airport through the city, leading to the Corniche (water front) and the port. In between you will drive through a number of roundabouts, some of which have installations showcasing Oman’s cultural heritage. While the city has its fair share of malls you will not see sky scrapers synonymous with neighboring Dubai. Incidentally, this is one city where you can technically be fined for a dirty car! The weather is typically sunny virtually every day of the year. Summers are sizzling hot (with temperatures reaching 49 C) and winters are warm with the nights occasionally chilly. Rain and clouds are an exciting change! November to February is the tourist season, the best time to head out to the beaches. The drive from the Corniche, along the coast to Marina Bander offers some spectacular views of the sea and mountains. The calm waters of the Gulf of Oman are suitable for snorkeling ,deep sea diving, dolphin watching and dhow cruises. The Marina Bander Al -Rowdha in Old Muscat is where all the tours begin. Driving further on, its a climb up the rocky mountains which eventually leads you to the Shangri-La Resort. The road takes you through some of the most barren and beautiful mountain scenery and just the drive is well worth it for the views it offers.From the top of the mountain you get some stunning views of the rocky terrain and the sea, and in the evening the sunset as well! And last but not the least don’t forget to taste the country’s well known delicacy, the Omani Halwa! The city seems well laid out and compact. Shades of brown, blue and black all around. Great post. Oman was already on my bucket list, but I will move it up!